The 25.51 metre sailing yacht Cinderella has been listed for sale by Jamie Collins at Oyster Brokerage in Palma. 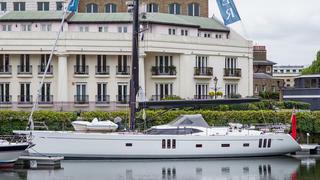 Built in composite by British yard Oyster Marine to a design by Rob Humphreys, Cinderella was delivered in early 2017 as hull number five of the Oyster 825 series. However, a change in her owner’s plans has brought her onto the market. Her interior joinery is finished in horizontal grain rift oak with white painted ash veneer and Tricoya painted panels, sleeping up to 10 guests in four cabins. These consist of a master suite, a double and two twins plus Pullman berths and all cabins have full en suite shower facilities. There are also quarters for two crew aboard this yacht for sale. The deck saloon is very light and airy with nine windows, two of which are opening. There are also six vertical non-opening hull ports, three on each side, with bookcase rails in each recess. A full length saloon table to port comfortably seats eight, and there is an entertainment centre concealed in the cabinetry which reveals a 32 inch Samsung LED television screen on a rise and fall mechanism. On deck, the walk-through teak-laid cockpit is over three metres long and offers excellent access from the companionway to the helm positions and side decks. To port is a varnished cockpit table with folding leaves and seating on three sides, making it an ideal area to enjoy a breezy sail with al fresco drinks and meals. On the technical side, she is sloop rigged with a Hall Spars carbon mast and boom including in-boom furling, and is powered by a Cummins 305hp diesel engine. Lying in Southampton, England, the price of Cinderella is available on application.